Probably the cancer survivor who most often expressed that sentiment is my friend Bert, diagnosed in December 2003 with stage 4 prostate cancer at the age of sixty-eight. Bert’s cancer was not operable, so he underwent eight weeks of radiation and eighteen months of hormone shots to try and slow its course. The radiation went fairly well, but the shots, which “turned off” his male hormones gave him severe hot flashes. “That gave me a greater appreciation of what women go through in menopause and I sure don’t want to go through childbirth!” Bert admits with a smile. Because Bert’s father and grandfather both had faced cancer, he wasn’t particularly stunned to get his diagnosis. That’s the decision Bert made many years ago. Since then his yearly PSA readings are in the normal range as he continues to be in complete remission from the cancer. But he has been told by doctors to expect it to come back at some point. I am so glad that Bert decided not to waste his cancer. I can’t begin to tell you all the folks in our support group he has encouraged in their cancer fight, as well as many others in his church and community. Whatever you and your family have suffered—whatever hardship still lies ahead for you—will you ask God today to help you not waste it? Heavenly Father, I wish I didn’t have to face cancer, but because I do, I’m asking You to help me not to waste it. Please take these painful, unplanned circumstances and turn them into an opportunity for me to show others that You are worth more than life itself. In Jesus’ Name, I pray. Amen. So where were you when the events of 9/11 unfurled? I bet you know exactly. I vividly remember I was standing in the chemo room at our oncology office chatting with patients when the first plane hit. It’s amazing how quickly your world can fall apart. One minute life seems pretty good, and the next minute you’re wondering how you ever will survive. A health crisis has the ability to shake our worlds in ways difficult to comprehend. A while back, I surveyed a bunch of my cancer survivor friends for remembrances of the day their worlds fell apart. “Surreal” is the term Wayne uses to describe how it felt to be told he had Stage 4 non-Hodgkin’s lymphoma at the age of forty-seven. Cathy says “denial and total shock” were the first two emotions she experienced after being told in November 2009 that she had breast cancer at age fifty-four. My nurse/reporter friend Cubby says disbelief also was her first reaction to a breast cancer diagnosis at age fifty-one. I think that’s pretty much a universal response to a cancer diagnosis. The story of the day your world fell apart may be similar to these folks or it might be quite different, but I’m willing to bet that after those initial strong emotions wore off, you were left with the same question for yourself or your loved one: What’s going to happen next? How difficult will the treatment be? And the $64,000-question: Will I/they be cured? I also think there’s a good possibility you or your loved one will be able to keep up a fairly normal life. I see cancer patients everyday in our office getting chemo and then heading out to their place of employment or home to do yard work. Most folks say they adjust to a “new normal” and enjoy the days with good energy, while resting more on the days when fatigue sets in. And if you want to know the overall survival odds, 64% of adult cancer patients still are alive five years after their diagnosis, according to the National Cancer Institute. Of course, I can’t promise my observations all will come true for you. I don’t know your future health any more than I am certain of my own. But I do know the One who does know it all. you will find me. I will be found by you,” says the Lord. Thank You, Lord, that You are not watching me from a distance, but You are close by and hear me when I pray. Please help me to trust that Your plans for my life are truly good ones. Amen. For years I’ve been wishing there was a book offering hope to those facing cancer which is not expected to be cured—not one on how to get ready to die, but one on how to keep living with cancer for the long haul. I wanted it to be a book for both patients and caregivers because when anyone in the family has cancer, it can feel like everyone does. And I really wanted it to encourage believers to trust in God despite life’s trials and to point seekers to a relationship with Jesus. But I couldn’t find such a book. 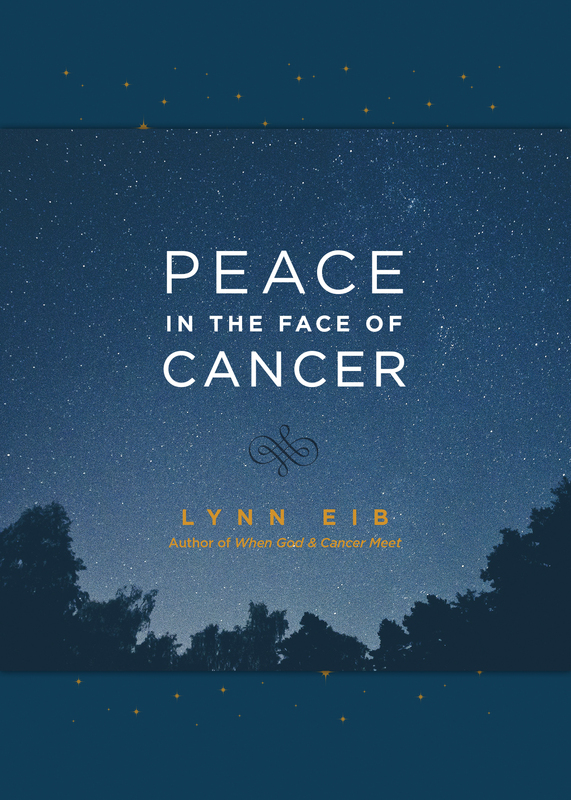 Peace in the Face of Cancer is slated to be released by Tyndale House in March 2017 and I’m so excited for the lives it will touch. And I’m especially excited that my editors pushed me to write it not just for those with incurable cancer, but for anyone, anywhere on a cancer journey. That made my writing task more difficult, but because of this broader scope, it’s a far better book with a far bigger audience—an estimated 14.5 million of us living with a history of cancer in the U.S. alone! I heard a speaker at a recent Christian writers’ conference advise authors not to share a book cover until a month before its release because people will forget. But I am so happy about the cover I just couldn’t wait! (Besides I’ll “remind” you later.) The cover is soft imitation leather like 50 Days of Hope and is just a little bigger (5×7 instead of 4×6). I love the shiny, gold foil stars and believe that looking up through the trees at a starry nighttime sky is a very peaceful feeling. I’ll be sharing excerpts as the release date draws closer and more about how this is going to be the first in a new series by Tyndale. The second “Peace in the Face of…” book already has been contracted to a famous NY Times bestselling author! Stay tuned for details. I knew her as “The Horse Lady” long before I ­ever knew her name was Nicola. And if I was writing a brochure about amazing things cancer patients have done while ­under­going treatment, the Horse Lady would be my cover photo. She got her nickname from Dr. Marc Hirsh, who initially had trouble remembering her name, but had no trouble bragging about her exploits to me even before I worked in his office. His favorite story was about how she loaded up one of her prized thoroughbred horses in her horse trailer, hitched it to her pickup, and drove all the way from Pennsylvania to Oklahoma. After delivering the horse to its new owner, she continued to drive herself to Mexico for a vacation. I’ve met a lot of amazing cancer patients. I know a man who earned his green belt for karate while being treated for lung cancer. I know a woman who went to dance class wearing a belt pump that released a continuous infusion of chemotherapy into her while she danced. I know another man who won a racquetball tournament a couple days after his treatment for widespread colon cancer. My friend Leanna started running 5K races after her diagnosis of Stage 4 melanoma. She’s not super-fast, but at age sixty-eight, she’s usually quick enough to win her age category! “I thought I’d give it a try to see if it would help me get better,” says Leanna, a grandmother of eleven who still works part-time babysitting neighborhood children and is in complete remission from the cancer. She’s even convinced her husband Larry, seventy, to compete in an upcoming race with her. Our oncology office even had our own version of Lance Armstrong with a patient named Eric, who was diagnosed with testicular cancer in 1987 at the age of thirty-one. Like Lance, Eric had Stage 4 disease, which had spread to his liver, lung, and groin in 1988. Now twenty-nine years after his diagnosis, Eric remains cancer-free and is enjoying life with his wife and three grown children. I was sad, though, when I read in his first book, It’s Not about the Bike, that he doesn’t believe in God, but rather only in himself and in his ability to be “essentially a good person.” He gives God absolutely zero credit for his recovery from cancer or his athletic accomplishments. Personally, I think God supplies supernatural strength to us many times when we don’t even realize it and that the reason our bodies have an amazing ability to heal is because He created us that way! Barb’s younger brother Tommy even bought silver bracelets for all the family members with the letters “BHS” engraved on the front. The bracelets were partly a Christian response to the “Live Strong” bracelets. But mostly they were a reminder that this family intended to live strong by God’s strength—even if they always didn’t have the fortitude within themselves. The initials BHS always reminded Barb’s family of their heavenly Father and of their earthly family: Barbara Hall Streeter and Barry Howard Streeter. Perhaps you feel 100-percent confident in your own abilities to face and conquer cancer, but there must be a little room for concern or you probably wouldn’t be reading this blog. Isn’t it good to know that you don’t always have to have it completely together, you don’t always have to just tough it out and you don’t always have to conjure up your own courage? Instead, at those times when you feel inadequate—or even hopeless—you can live By His Strength. Don’t be discouraged by whatever you—or doctors or medicine—can’t do, but live on the basis of what God says He will do. Lord, I do want to live strong and I want to do it by Your strength. I’m so grateful that You have what I need to get through each day. In Jesus Name, I pray, Amen. Are you or your loved one an ideal patient? I’m not asking whether you do everything the doctors tell you to do. I’m not referring to whether your disease is easily treatable. And I’m not talking about whether you have the right personality. What I do mean is this: Do you have the right blend of realism and faith as you live wondering when and if your or your loved one’s disease will be cured? If you haven’t already reached “ideal” status, I pray I can inspire you to achieve it, and if you’re already there, I pray I can encourage you that it’s definitely the best place to stay. I think that an ideal patient is one who believes firmly in the power of prayer and has no doubt that God can answer with a miracle. Such a patient prays for complete physical healing, absolutely believing that God can do it and feverishly praying that He will do it. But this ideal patient also recognizes that God is sovereign—He is absolute, unlimited, independent, and has supreme authority over us and everything else in the world. Such an ideal patient understands that when we give our lives to Jesus, we give up our rights and give Him the right to do whatever pleases Him with our lives. When we’re “ideal,” we pray and believe for a physical miracle, but never demand it as the only answer to our prayers. Some people might say that our faith is decreased if we don’t absolutely “expect” a miracle, but I think it takes even more faith to continue to trust God, stand on His promises and cling to hope when we aren’t healed. It is not a lack of faith to accept whatever God’s will is for us. It’s a true sign of faith to trust Him no matter what happens—or doesn’t happen—in this lifetime. I pray you will be an ideal patient: trusting God as you pray for His physical healing touch to come and trusting Him still if it doesn’t. I’ve just received word from Tyndale House that my manuscript for my new book Peace in the Face of Cancer has been “enthusiastically accepted!” This book has been rolling around in my head for at least a couple of years and I just couldn’t really relax in retirement until I got it out. For a long time I’ve been wanting to write a book that would be especially for those facing cancer that is not expected to be cured. You know the descriptions. Treatable, but not curable. Chronic cancer. Always in treatment. Cancer for the long haul. This new book–coming out next March–even includes three bonus chapters at the end just for such folks: Why doesn’t God heal? How to dance with cancer instead of just battling it. And how to live AND die well for Jesus. 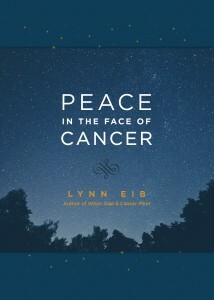 And the really good news is that Peace in the Face of Cancer actually is written to speak to the needs of ALL survivors and their caregivers no matter where they are on their cancer journey–newly diagnosed, in treatment, living in cancer’s shadow, dealing with a recurrence or trying to buy more time. Not sure if you’re a survivor yet? The National Cancer Institute says we become survivor “from the time of diagnosis until the end of life.” So survivors include folks who have just found out they have cancer, people who used to have cancer, and those who can expect always to have it. Pretty sure that means everybody who has ever heard those three dreaded words: You have cancer. As I write, there are an estimated 14.5 million people in the U.S. with a history of cancer and about the same number of new diagnoses is expected worldwide this year. That’s an incredible total of survivors, but I wonder how many meet only the first dictionary definition of survive: to remain alive or in existence? And how many also portray the second meaning: to continue to function or prosper? Between my former job, my cancer prayer support groups and my speaking-travels, I literally have held the hands of thousands of people facing this disease. I count it a real privilege to walk with hurting people, whether the ones with the medical chart or the ones standing nervously by. But despite my huge number of cancer-acquaintances (including about 90-percent of my Facebook friends! ), I never would presume I know exactly what you or your loved ones are going through. Each patient and caregiver journey is unique, but chances are good that you and I have shared some of the same feelings over the years. And chances are very good that I know someone who has been in a very similar medical situation to yours. And I think it’s especially feasible that you, like me, at times have trouble finding peace in the face of cancer. It’s definitely difficult to feel peace…but it is possible. If I come to your mind, please PRAY for this book as it goes through the editing and design process and that God would use it to bring PEACE in the face of cancer to those who need to hear that message.